ThinkOR - Think Operations Research: The Numerati: casting OR folks in an evil light? The Numerati: casting OR folks in an evil light? I think it is great that operations research is getting some publicity with The Numerati. However, there can be such a thing as a bad publicity. Is it just me or does it seem to everybody (OR folks) that this book is casting us in a rather negative light? I think the general notion is already that the numbers guys are not to be trusted (at least in certain health care places). Now this book may be saying how smart we are and all that, but with a bit of an evil undertone. Just the title itself, "how they will get my number and yours", is painting us as some kind of math hackers out to steal people's information, isn't it? I have mixed feelings about this book, but I am curious to read it. I just hope we won't scare anybody more than now when us OR people walk down a hospital isle. Feel free to voice you thoughts on The Numerati. Hi Dawan, I think you raise a good point, and I certainly expect it. I think if you read the book you'll see that it tries to balance the risks and opportunities. It starts out looking at workers, where the bosses own our data and are eager to optimize us. That might sound a bit threatening. What's more, the BW excerpt condensed it, and in doing so accentuated this angle. The cover added to it. But as the book continues, it attempts to show that the analysis of our data is inevitable, and in many ways positive. The trick is to understand how our data is used, and how to put it to good use for ourselves--to become data masters. So by the end of the book, the Numerati are helping us keep healthy, protect our parents from falls, and even (try to) find the right date. In any case, if you read it, I'll be interested to see what you think. One more note: The cover you show is the British edition. They have that ominous subtitle. The American edition doesn't include it. Also, we're doing a behavioral targeting campaign for the book. I'm blogging about it at thenumerati.net. Some of the ads are about the changes in society, others are scary. We'll measure the responses. Thanks for your reply and explanation of your angle. I'm sure it makes marketing sense to try to get people's attention by saying that someone might be threatening their privacy - it certainly got mine. :) I still hope to read your book and to find how it will continue to explain the advantages of doing things the efficient way - being optimal. I'm simply concerned about the reputation of the operations research field. I'm sure you tried to show the opportunities of thorough data analysis, but people sometimes just don't read everything and first impressions stay for a rather long time. 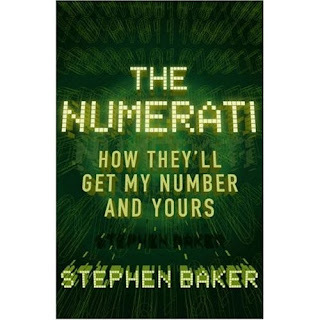 Particularly with ads targeting on the "creepy and invasive nature of the Numerati", it may not help our image since majority of the ad readers will not read the entire book. Then again, it makes marketing sense to try to push the book that way.